NOW: Center-right, the King County’s “green” Chinook Building stacks thirteen stories above the northwest corner of 5th and Terrace. Behind it and up Jefferson Street at its southwest corner with 6th Avenue is the county’s also new Goat Hill Parking Garage. 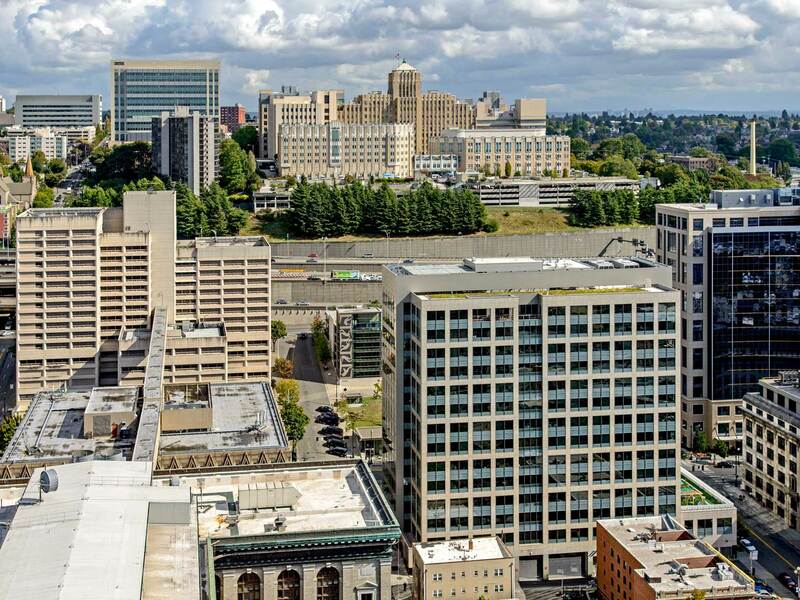 Let us now celebrate Goat Hill, the latest of the imaginative names given to First Hill or parts of it since the original settlers first climbed it in 1852. They named it then for its obvious distinction. The about 366 foot high (near Broadway and James) ridge that lifted from the central waterfront like a green curtain of firs, cedars, hemlocks and alders was the first hill to climb and cross when either trailblazing east to the “big lake” eventually named Washington, or wisely following the “Indian Path’ that reached the lake roughly in line with the present Yesler Way. 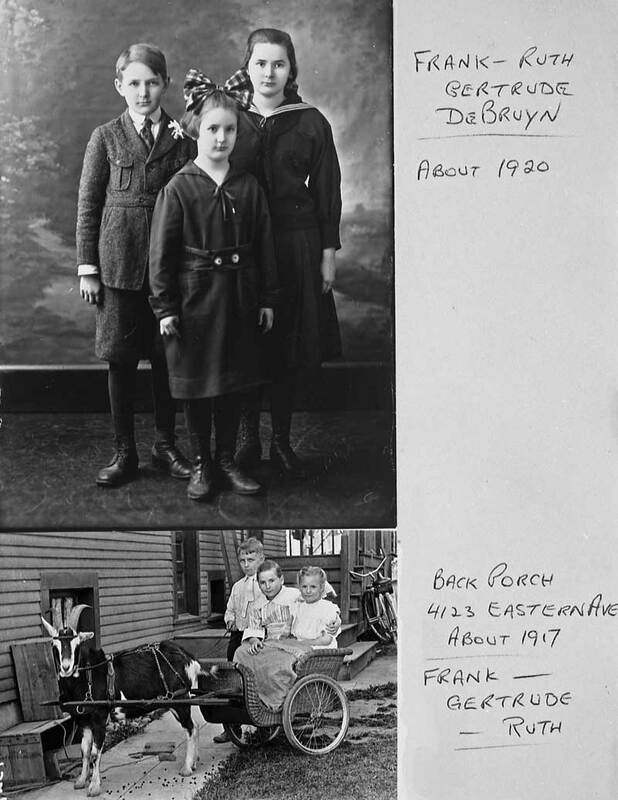 I learned of the “Goat” tag only recently when railroad historian Noel Holley shared with me the photo printed here. 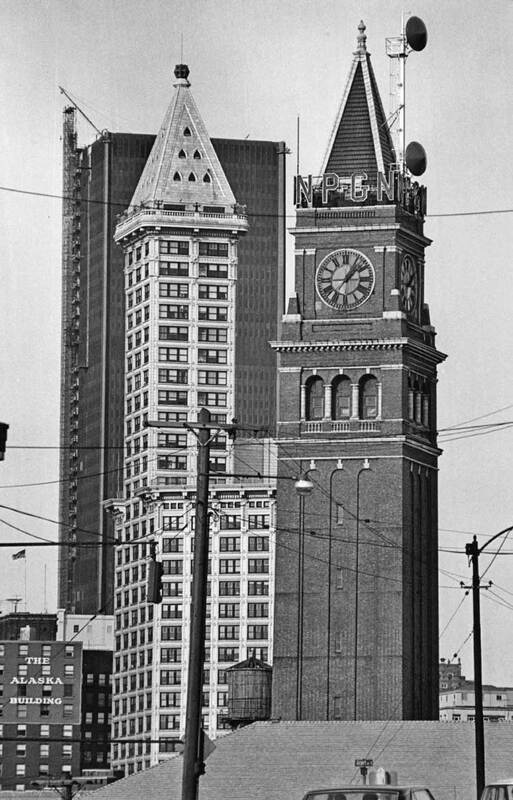 His friend, Wade Stevenson while visiting Seattle from Othello, recorded it from the Smith Tower. 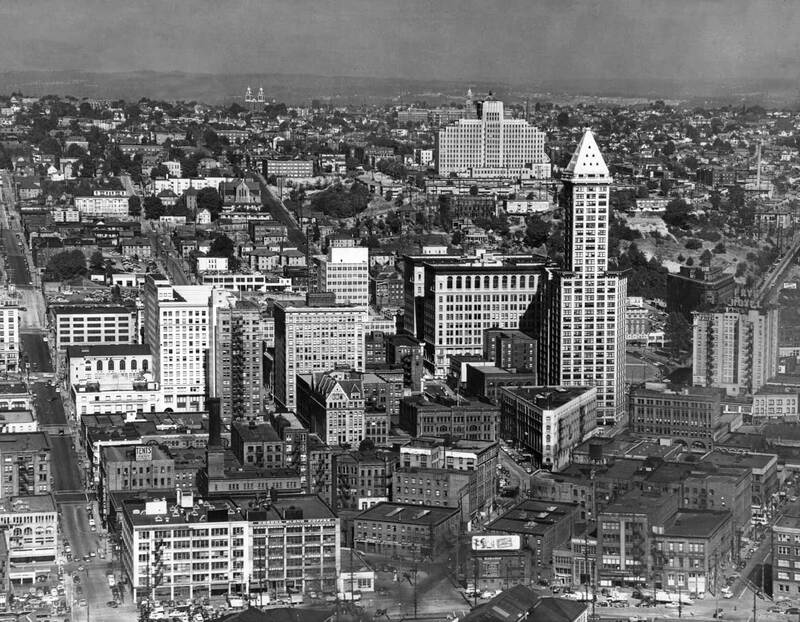 Noel figures “it was about 1960.” This, then, is a late look at First Hill’s western face before the freeway was cut across it. Stephen Lundgren’s look across Goat Hill from the Yesler Way I-5 Overpass with Harborview peeking above the second growth landscape stepped above the Interstate-Five ditch – here. 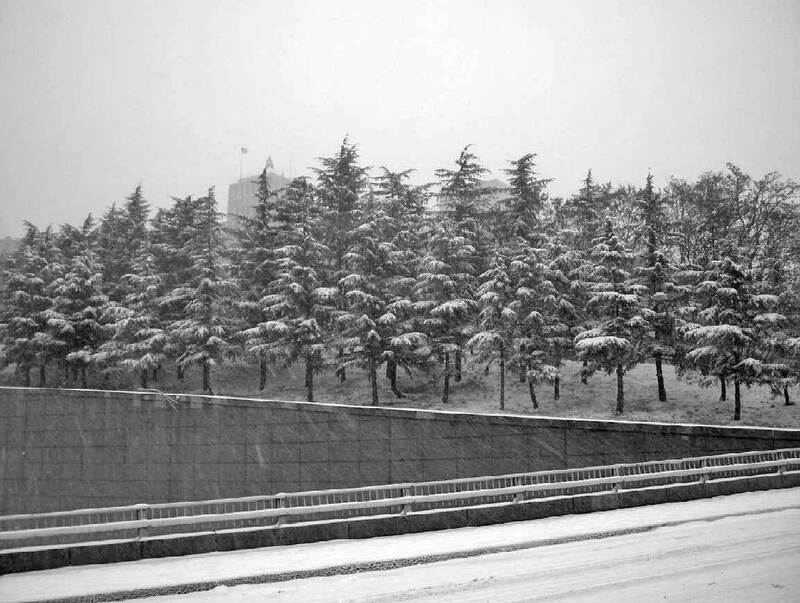 Another of Lundgren’s recordings of Snow Falling on Goat Hill – here AKA Pill Hill, Yesler Hill, Profanity Hill and First Hill. 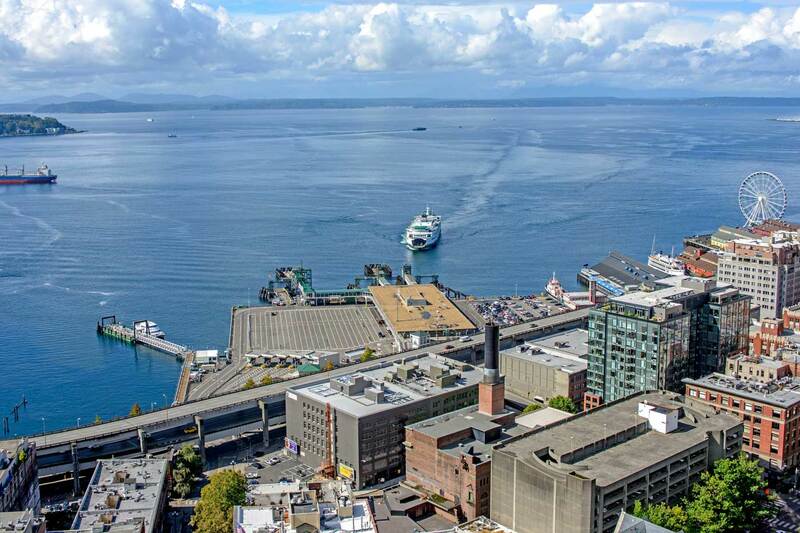 On the right is Harborview parking. 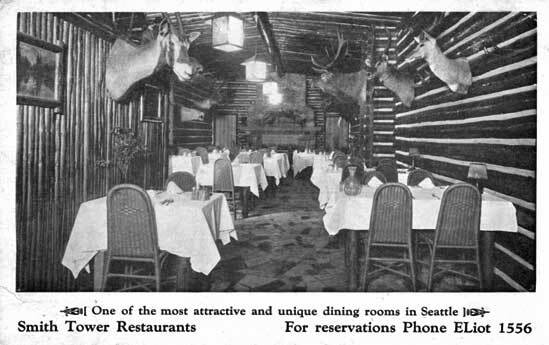 The Smith Tower Log Cabin Restaurant shares the Call of the Wild at the base of the Highest Piece of Modernity on the West Coast then – unwitting wood, perhaps, for the forest that was felled and what followed. 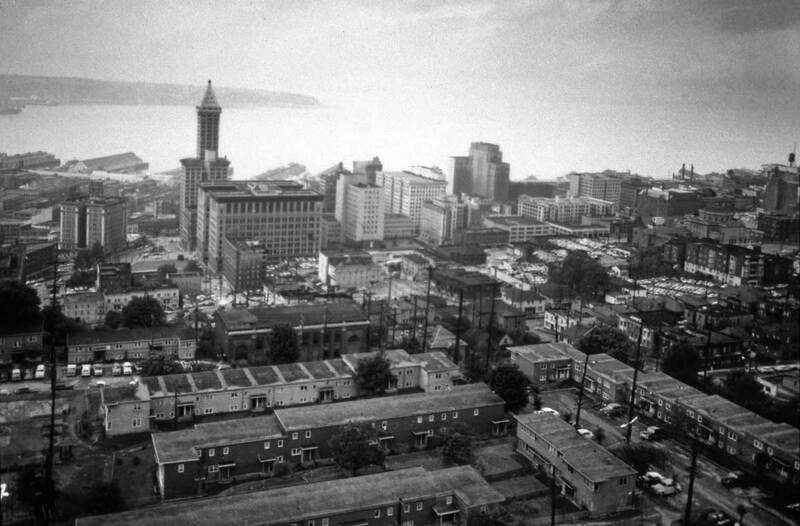 Through its mere 162 years of development and complaints, First Hill – or parts of it – has had many names including Yesler, Pill and Profanity. This last was a folk creation of the late 1890s when lawyers and litigants started using “bad language” during their steep climb to the King County Courthouse which sat then on the brow of the hill about 300 feet above Pioneer Square. 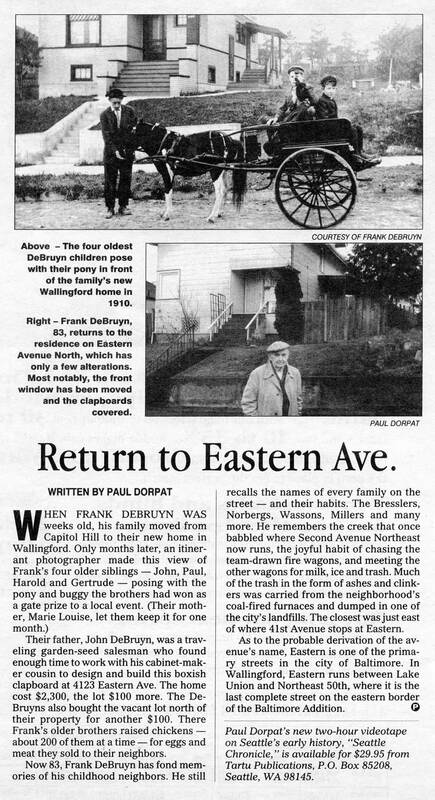 Now we have another ascribing folk name for the part of First Hill west of the I-5 Freeway and south of James. Anything to add, old goat? 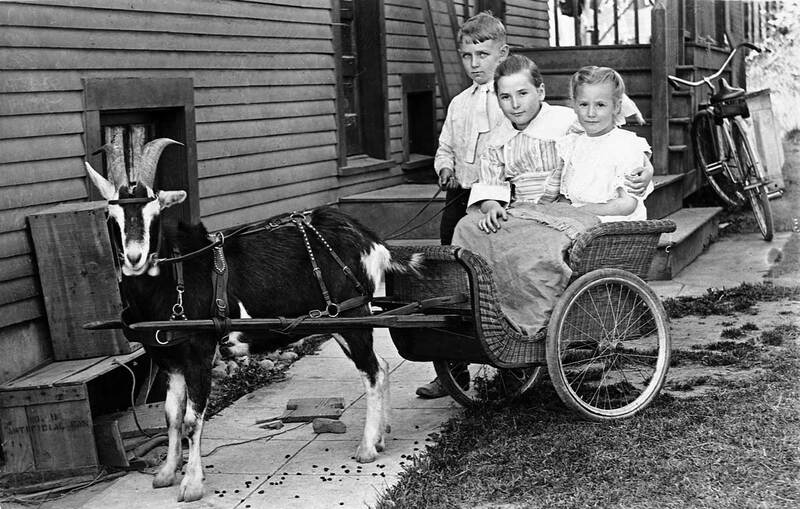 Surely Jean, and we will start with a few goats, beginning with a goat on goats, one of the many Kodachromes left with us by Horace Sykes, whose transparencies we shared with the “Our Daily Sykes” feature that we ran for at least 500 days – we hope without missing any. Here first is a Sykes that we did not use, waiting we were for some Call of the Goat. Following that we will introduce a Wallingford goat on Eastern Ave. and accompany it will be a pony on Eastern Ave. as well and it’s own Pacific feature. Both of these neighborhood animals came from my neighbor Frank Debruyn, now passed. 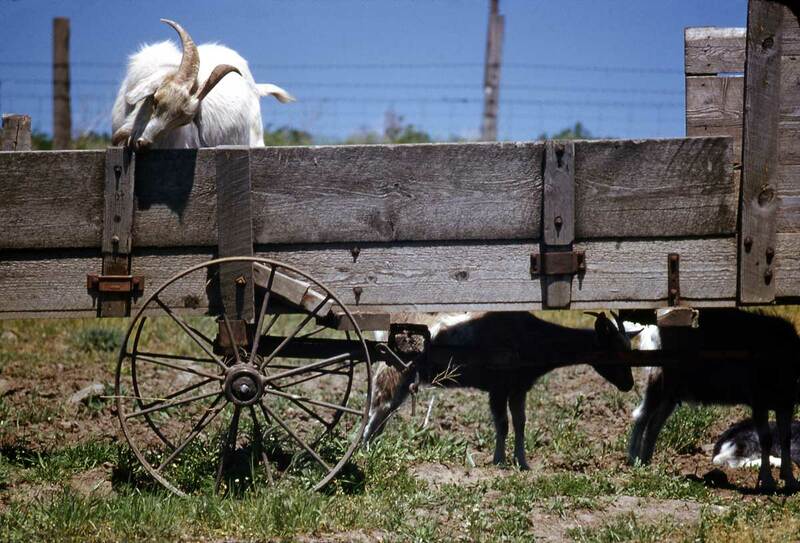 While his pony made it into Pacific on Nov. 15, 1992, I assured Frank that his goat would be used as well – sometime. Now’s the time Jean – and Frank. Following the farm animals, Ron Edge will put up more links to related stories that have appeared on this blog previously. Most of these are on First Hill subjects. As with music these features are their own motifs and so gain new resonances and harmonies when mixed with other features. That, at least, is what we hope. A story shared by Frank DeBruyn my once energetic neighbor, now passed. This feature first appeared in Pacific on Nov. 15, 1992. The ordinarily battling Rev. 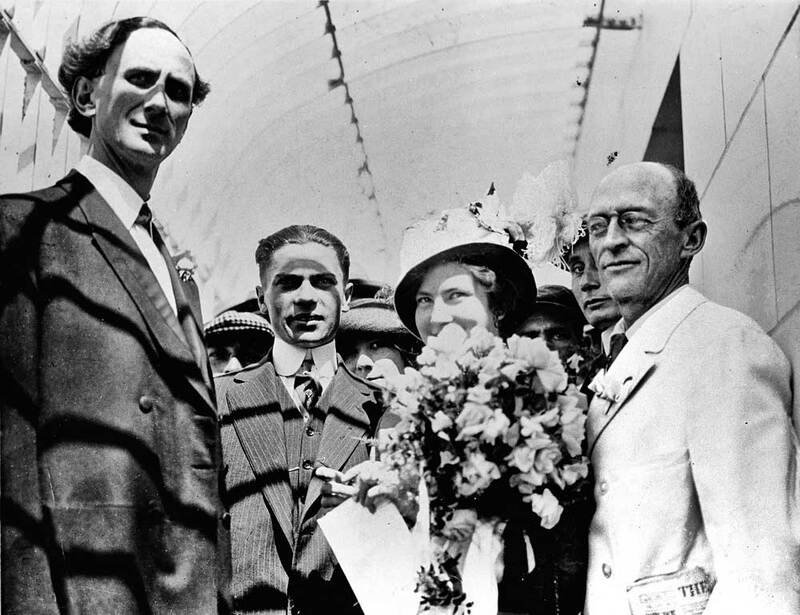 Mathews (First Presby) and Mayor Hi Gill frame unnamed newly weds on the platform of the then (1914) new Smith Tower observatory. Singer-Songwriter Laura Weller and popular Puget Sound Disk Jockey Scott Vanderpool at their wedding party on top of the Smith Tower. 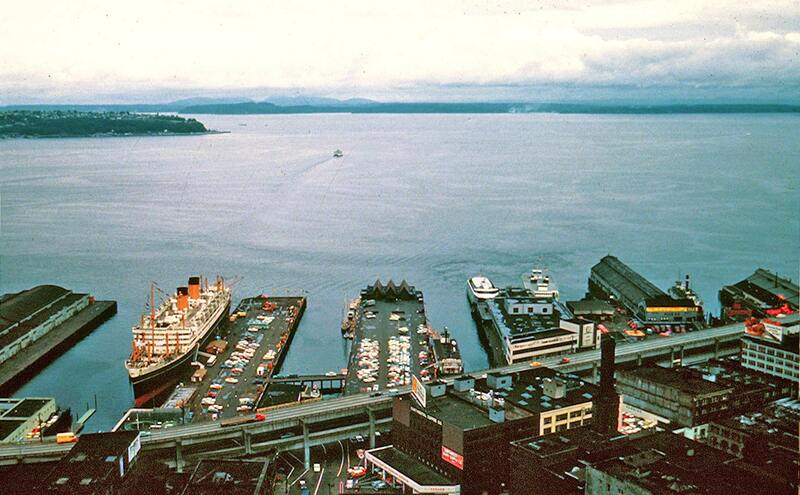 Above and below INTERSTATE FIVE (aka The Seattle Freeway) building south through Goat Hill in the early-mid 1960s. From Harborview’s tower, ca. 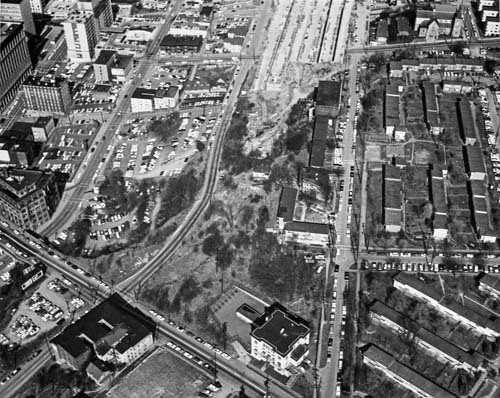 1955, across the northwest corner of Yesler Terrace, eventually lost to Freeway construction and the hospital’s expansion. 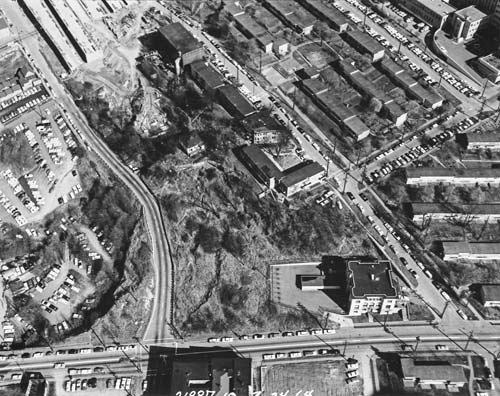 April 11, 1950, a Pacific Aerial record of Goat Hill, nestled between the business district and Harborview Hospital. 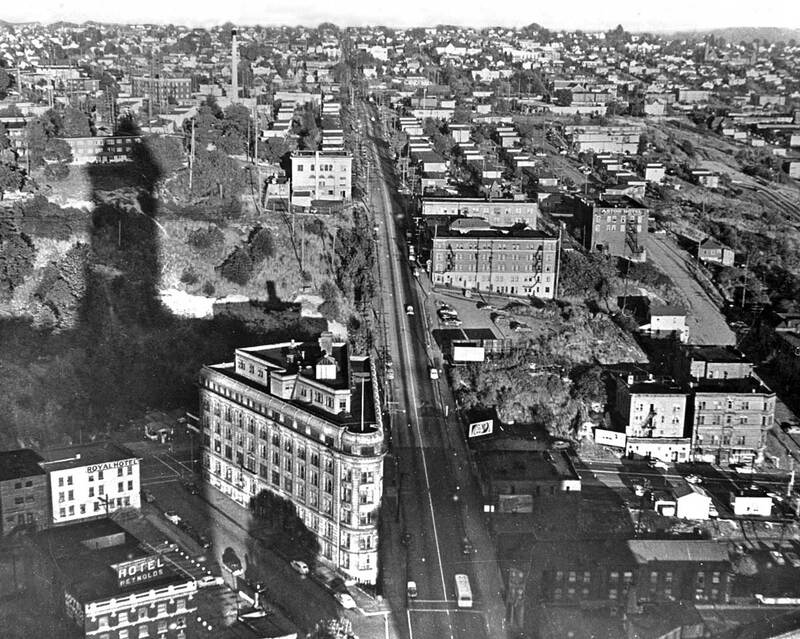 The Smith Tower casts its shadow up the rough terrain of Goat Hill. 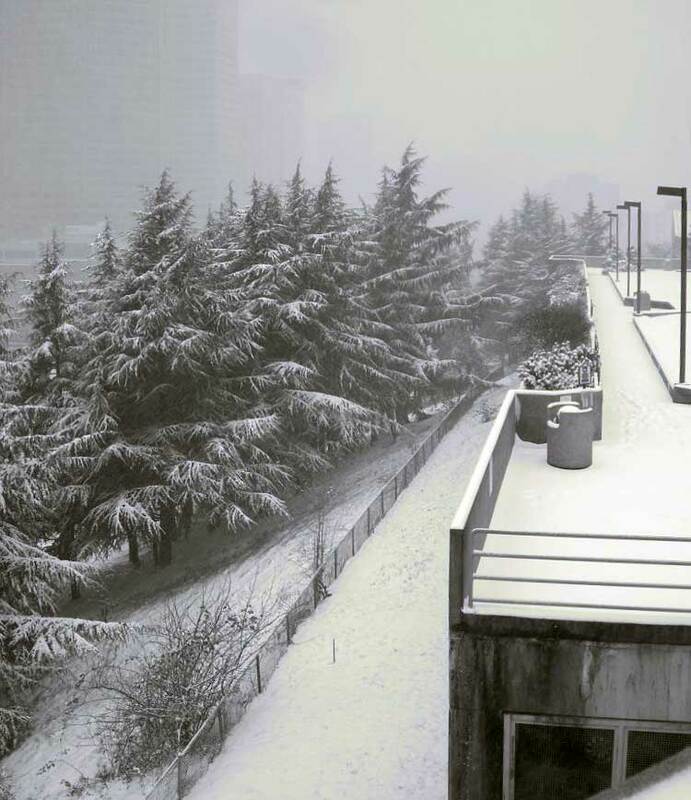 Yesler Way splits the landscape. 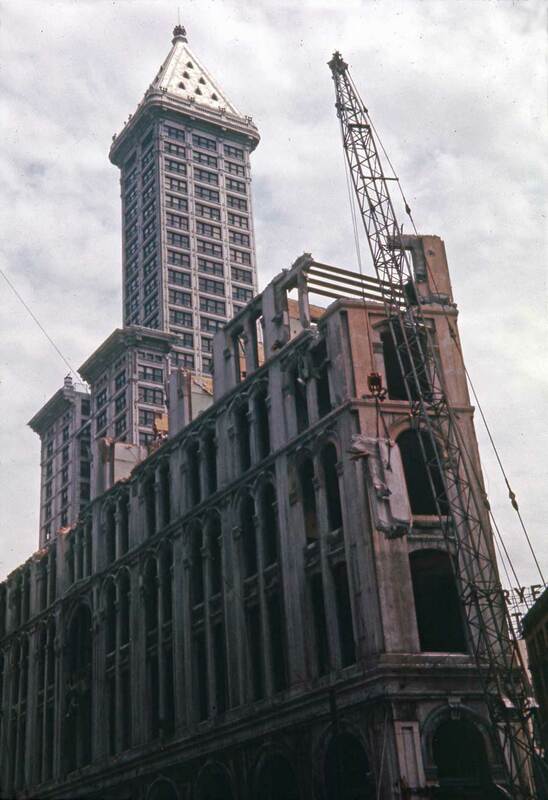 Lawton Gowey’s juxtaposition of the squandered Seattle Hotel with the Smith Tower beyond it – June 8, 1961. 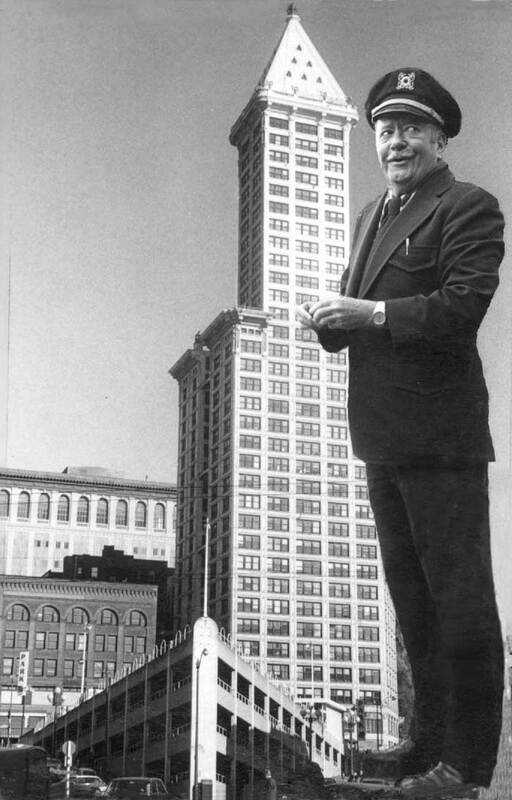 In 1976 Ivar bought what he described as his “last toy” – the (about) 42-story Smith Tower, which as a child in West Seattle he watch ascending across Elliott Bay. Ivar was born in 1905. The tower was dedicated nine years later. 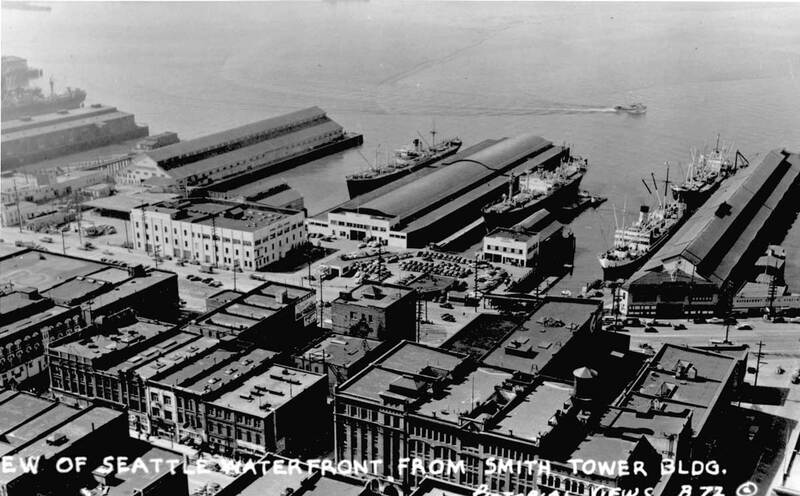 Wade Stevenson also recorded the waterfront from the Smith Tower observatory, and included prints with those he gave to his friend Noel Holley. We print them now beside Jean’s recent coverage of the same sections of the waterfront nearest the Smith Tower and Pioneer Square. We will include a few other examples, as well. Wade Stevenson looks west-southwest to piers 45 thru 48. Bottom-left is the intersection of First Ave. South and Main Street. Ca. 1960. Nearly the same coverage, ca. 1940. Lawton Gowey’s recording from Aug. 27 1971. 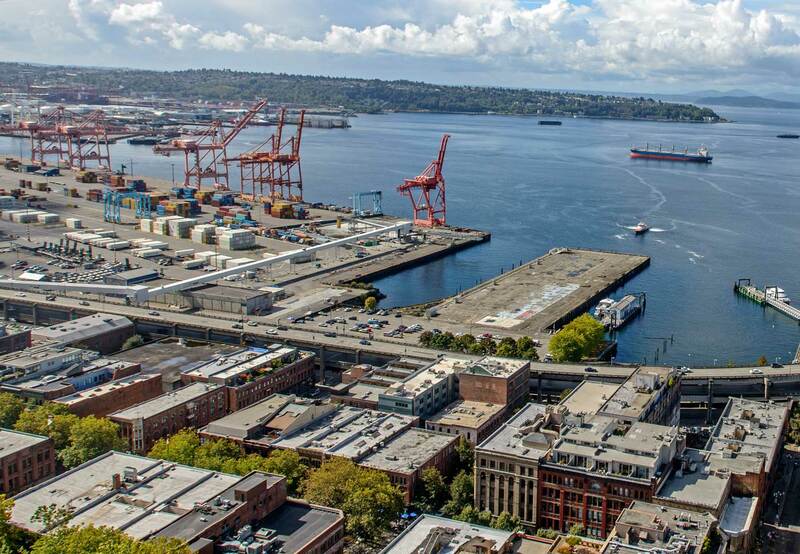 The Port of Seattle’s early parking for containers is far left, and an Alaskan Ferry is parked along the north side of its terminus then, Pier 48. Jean’s recent and wider look down on the same waterfront. The big shed on Pier 48 no longer holds on. I fondly remember the winter Book Fairs there, sans heat, but warmed by crowds. Wade Stevenson’s ca. 1959 record of Piers 50 thru 53 – left-to-right. 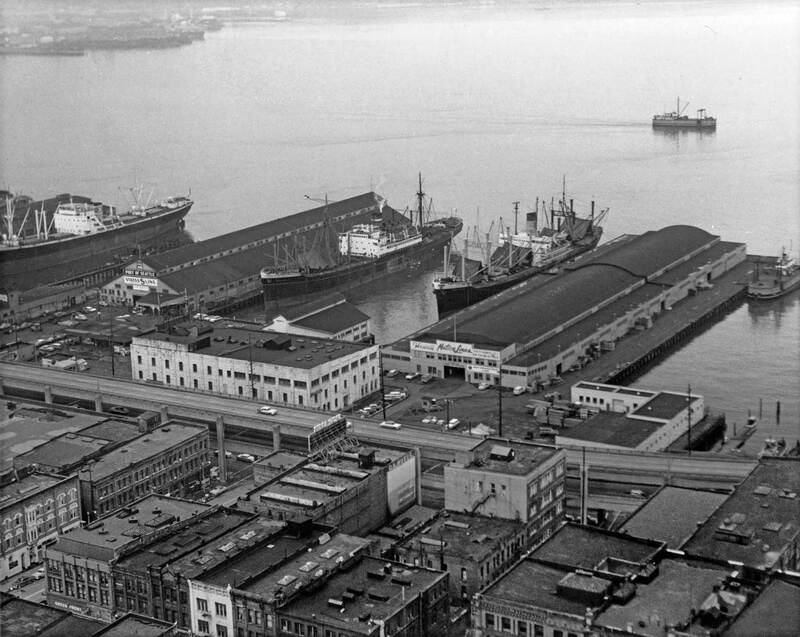 The 1930s Art Deco styled Colman Dock is still holding to Pier 52, right-of-center. 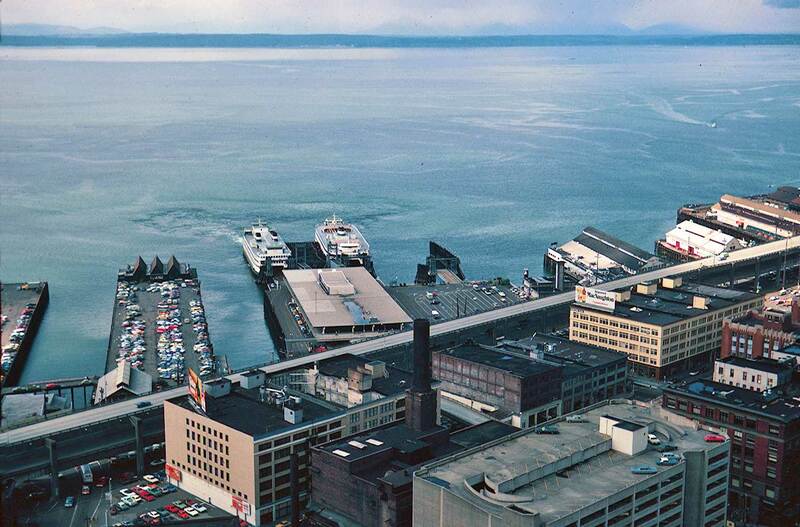 The Kalakala is parked between Piers 50 and 51, the Alaska Piers. The pier shed on Alaska Pier No. 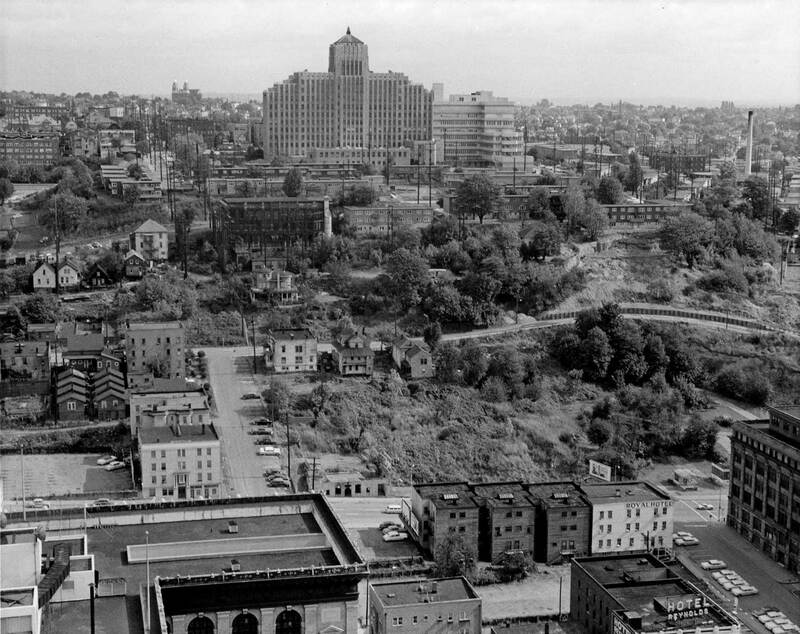 1, far left, is still in place in 1961. Pier No. 2 has been striped for the Polynesia Rest. and parking in anticipation of Century 21. Gowey dated this June 21, 1961. The Kalakala has moved one slip to the north. The pan reaches as far north as the water end of Pier 56. 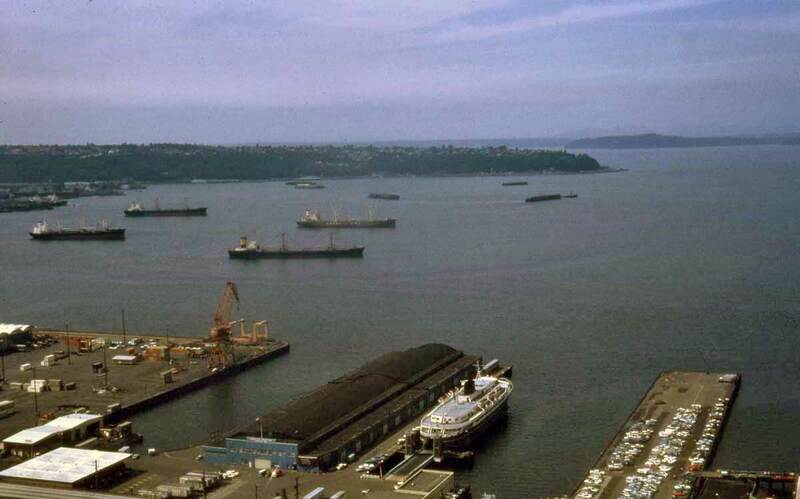 On its last trip for scrap (to Japan) the Dominion Monarch parked at Pier 1 as a “botel” through the Century 21 summer of 1962. Lawton Gowey. 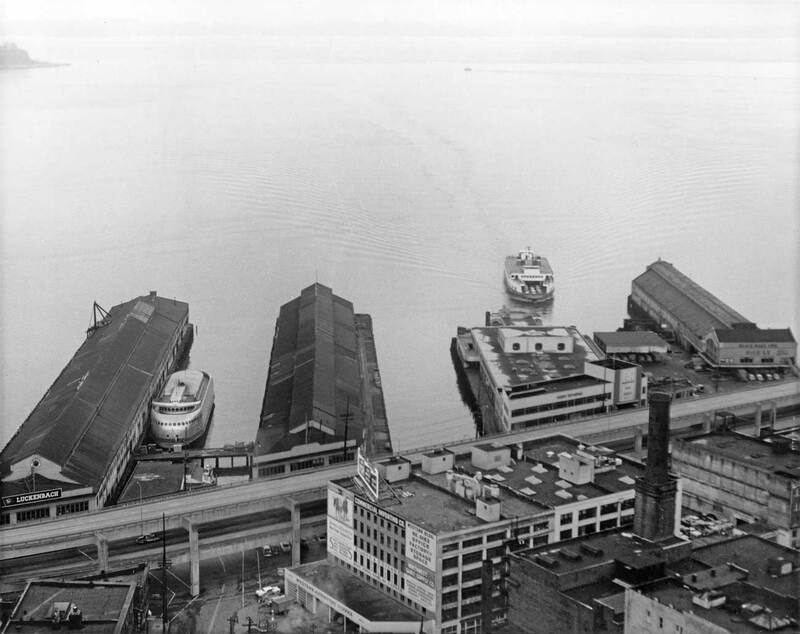 Lawton Gowey records the new Colman Dock, with the Grand Trunk Pier 53 also razed for DOT parking. Jean’s recent recording continues north to feature what has become the Dept. 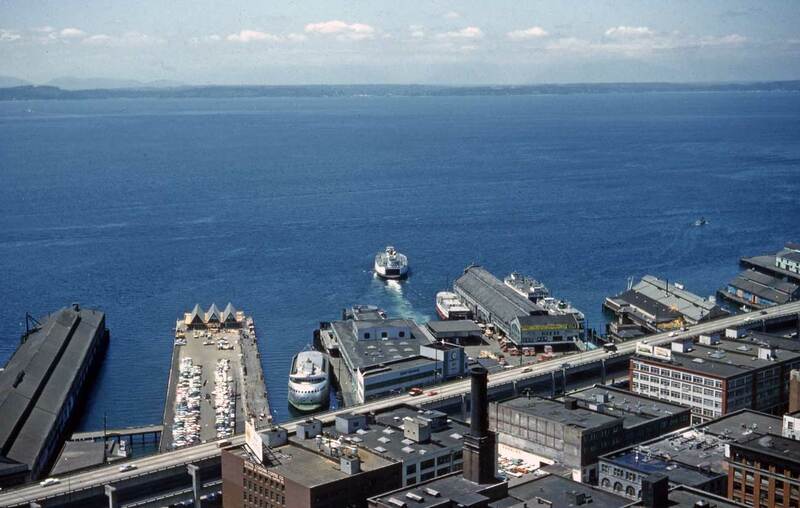 of Transportation’s sprawl for ferries to both sides of Colman Dock. 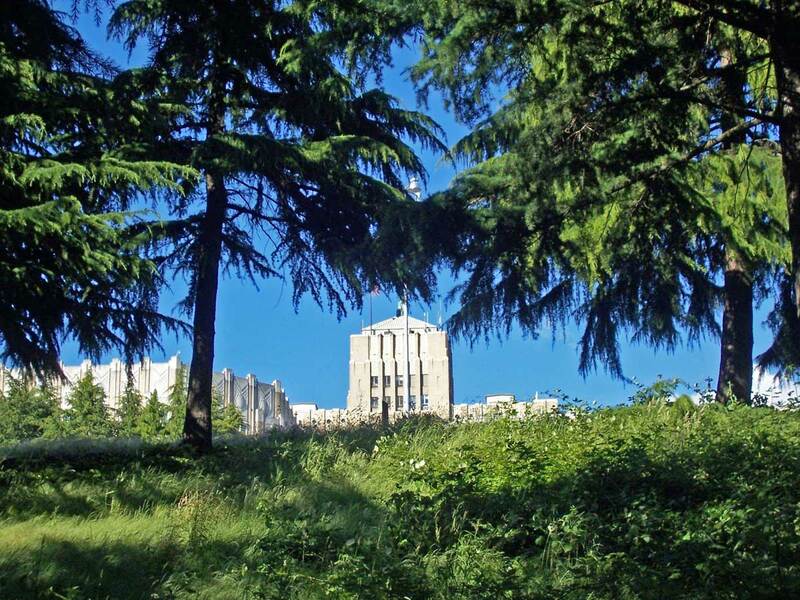 A recent look up Goat Hill to Harborview. Earlier I did not remember who recorded it. I speculated “Perhaps she or he will come forward.” He did. It is, again, Stephen Lundgren. I should have known.